Styled like a riding boot, this womens tall rain boot has black synthetic leather legs and a glossy black waterproof foot up to the first seam. A removeable broad black ankle strap with adjustable buckle fastener and 9cm (3.5 inch) lace up at the back of the boots topline gives a touch of decoration to a practical and pretty solution for puddles. Inside the rain boot is lined in a black brushed, soft to the touch textile while for ease of fit a full length zip travels from instep to topline. 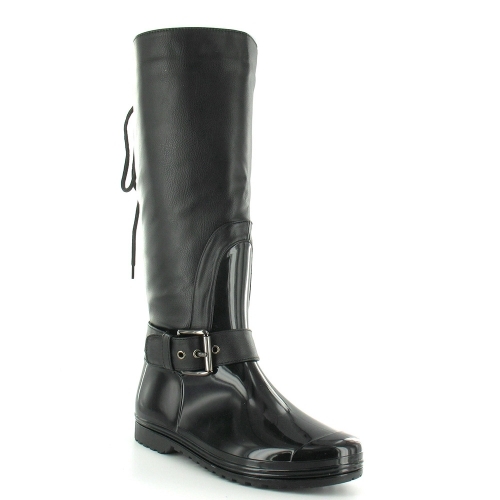 Finishing this fantastic womens tall rain boot is a flat ridged sole and heel.